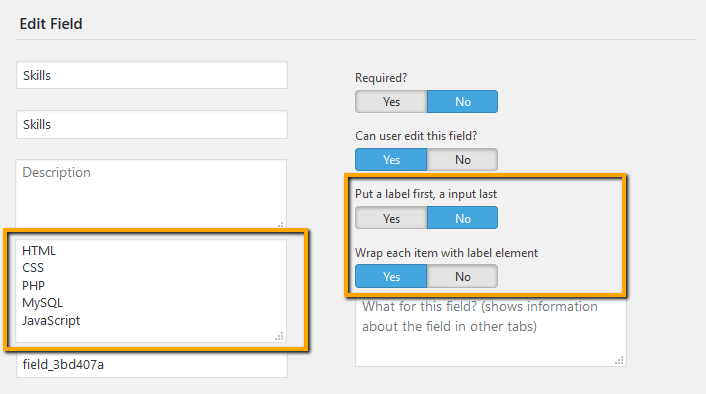 wpForo User Custom Fields addon allows you to create different types of custom fields. Current available field types: Text, Email, Phone, Url, Date, Color Picker, Number, Password, Drop Down, Radio, Checkbox, Textarea, File Upload, Avatar, Usergroup, HTML. Placeholder – The placeholder attribute specifies a short hint that describes the expected value of an input field (e.g. a sample value or a short description of the expected format). The short hint is displayed in the input field before the user enters a value. 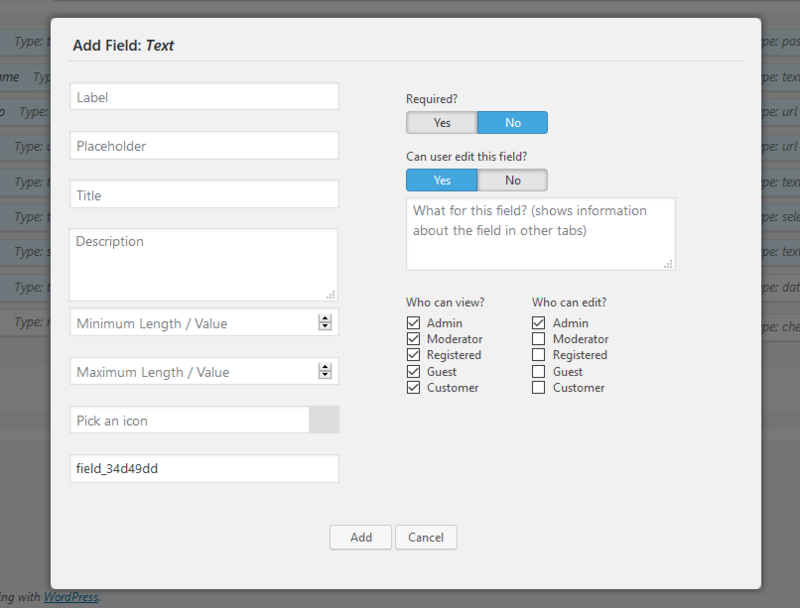 Title – This attribute specifies extra information about field. The information is most often shown as a tooltip text when the mouse moves over the element. Description – This is a small description about information you should insert in this field. Description is displayed under field with small font size. Max/Min length/value – The max/min attribute specifies the maximum and minimum value for a field. For text fields it specifies the maximum length of inserted string. Icon – A font-awesome icon, which is displayed on left side of each field. Required – Whether this field is required or not. 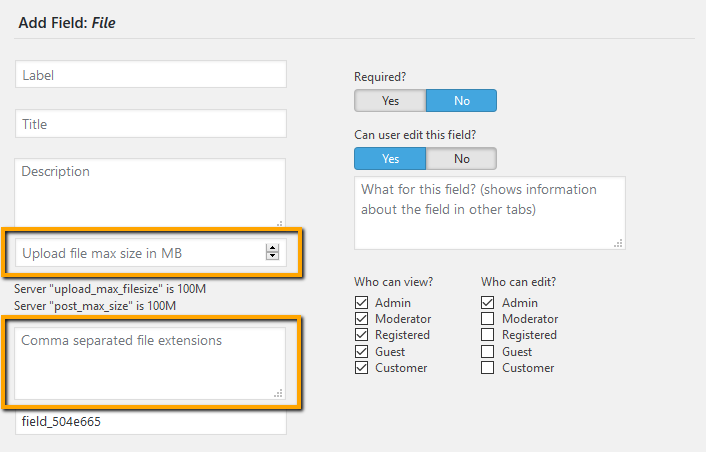 Can User Edit – This option allows user to edit this field value in own My Profile > Account page. 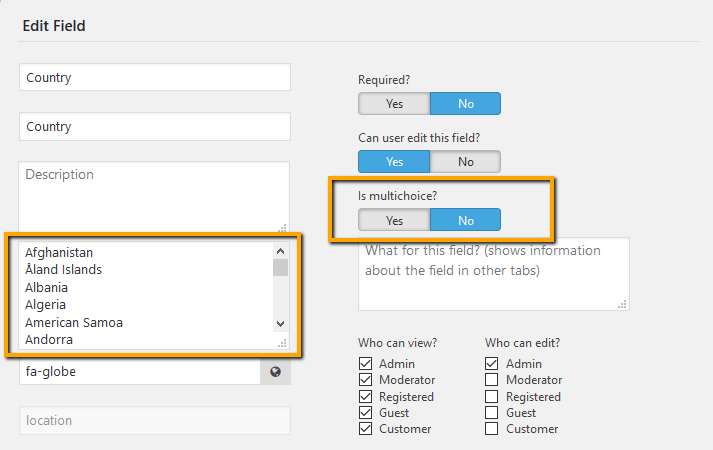 If this option is set “No” only field value will be displayed on Account edit form, there will not be text editor field to change the field value. Text, Email, Phone, Url, Date, Color Picker, Number. 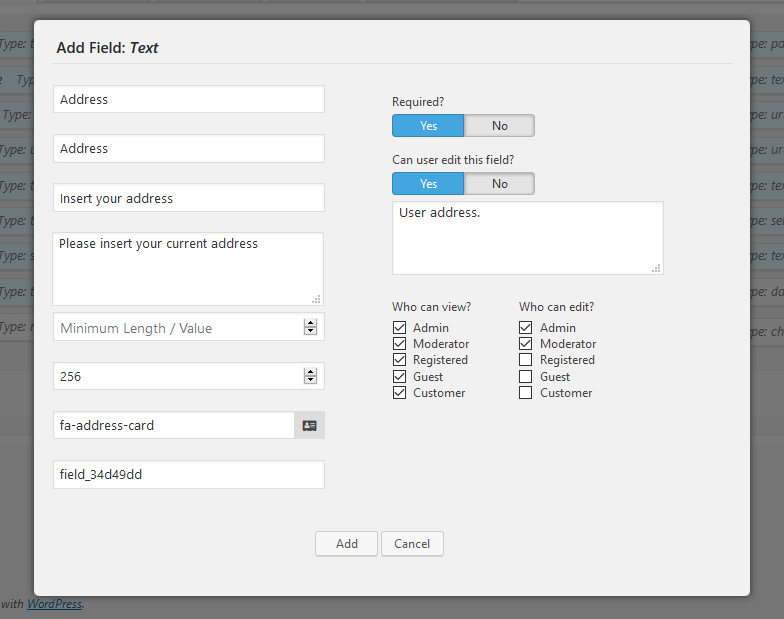 These fields are simple text fields with according (email, url, etc…) data validation. They don’t have specific options, all is described above. This modification is done automatically based on current page template. You don’t need to do extra configuration. On both forms this field can not be deleted and inactivated. You only can change Label, Title, Description and other general and specific options. Note: By default there is a Password field in field list. You cannot add more than one password field to the same form, thus this field type is inactive. Values – this is the place where you should insert dropdown options/values. They should be inserted one per line. Is multichoice? 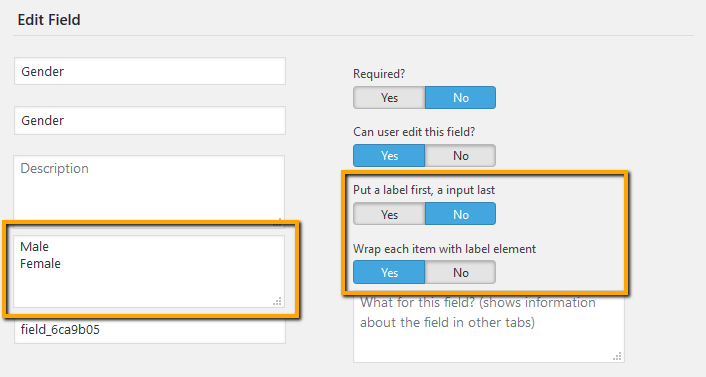 – If this option is set Yes, the field will look like and enlarged dropdown menu which allows you select more than one option using Ctrl + Mouse Left Click button. The radio field type provides radio buttons to select different options. You can only select/check one option. If the field has a saved value this is selected when the page is first loaded. If not, no value is selected. 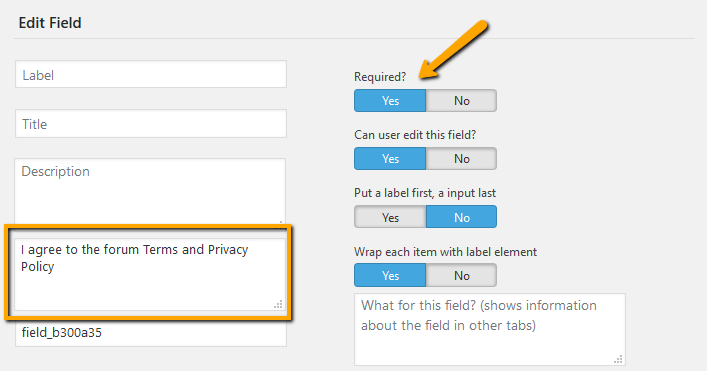 The checkbox field type provides a single or multiple buttons to select different options. You can select/check more than one option. If the parameter has a saved value this is selected when the page is first loaded. If not, no value is selected. Values – this is the place where you should insert options/values. They should be inserted one per line. Adds a file uploading field. Besides all general options, radio and checkbox field types have three specific options. Upload file max size in MB – You can not set this value more than “upload_max_filesize” and “post_max_size” displayed below this option. If you want to increase server parameters please contact to your hosting service support. This is a default field and used in Account Settings form. This field is a package of avatar type options. Note: By default there is an Avatar field in field list. You cannot add more than one avatar field to the same form, thus this field type is inactive. This field is used in Account Settings form by default (in this page it’s only available for forum administrators). However you can use it for Registration and Member Search forms. IMPORTANT – Please never include Admin and Moderator Usergroup in this field for Registration Form. This will allow users register as administrator and moderators. This is not a field element for data inserting. This creates a HTML area in forms. You can write any HTML code you want and display it with other fields. For example if you want to group fields with separators or with some text blocks you can create HTML fields (with HTML code) and put between regular fields you want.